If there were ever a historical person who would surely be a Grinch at Christmas time, I’m sure many people would put forth that that person would be Hitler. Dr. Gerry Bowler’s book Christmas in the Crosshairs: Two Thousand Years of Denouncing and Defending the World’s Most Celebrated Holiday is an interesting romp through history showing (among other things) how the world’s most celebrated celebration simply can’t be ignored — not by anyone — not by communists, nor fascists, nor even the National Socialist German Workers’ Party — better know as the Nazis. In one of the most fascinating sections of the book, Dr. Bowler documents how the unstoppable force that is Christmas was addressed by the totalitarian regimes of the 20th Century. The most interesting and, dare I say, outlandish attempt to stop Christmas was by none other than Hitler. Hitler understood that Christmas tradition was “deeply embedded in the German consciousness” and in “what it meant to be truly German.” Therefore, it wouldn’t work to simply ban it. Even before the 1933 elections that brought Hitler into power, the Nazis used Christmas to advance their anti-Semitic agenda by urging consumers to boycott Jewish businesses. This included picketing and vandalizing Jewish-owned businesses. After 1933, Goebbels and his Ministry of National Enlightenment and Propaganda went to work rebranding Christmas. Not only did they use Christmas to promote their hateful nationalism, but they would eventually try to wipe the “Christ” out of Christmas. After all, what could the most notorious anti-Semitic regime in history have to do with a season celebrating the most influential Jew of all time? In the same year, a film was released depicting the Nativity with Mary, Joseph, and the newborn Prince of Peace not only beneath a portrait of Hitler, but surrounded by Nazi stormtroopers and medieval German knights. Also in 1933, the German Christian Movement took control of the national Protestant Church and aligned it with the Nazis. Jesus — a Jewish Middle Eastern man — was recast as an Aryan victim of the Jews! Alters were decorated with swastikas, and pagan ceremonies were introduced. Nativity plays were banned. Pastors like Martin Niemoller and Dietrich Bonhoeffer resisted, resulting in imprisonment for one and martyrdom for the other. A Christmas narrative song called Heliand, which begins with John 1:1 (“In the beginning was the Word, and the Word was with God, and the Word was God“), changed into a song about “German myth, dragons, adultery, blood feuds, and racism.” To top it all off, Jesus was presented as the ancient Germanic god Wotan (also know as one-eyed Odin of Norse mythology). Perhaps against his own instincts for self-preservation, the president of the Reich Musical Chamber actually protested in 1937 against an attempt to change the biblical lyrics to Handel’s masterpiece Messiah. In the years following, Christmas became more nationalized, secularized, and paganized in Germany. Hitler issued instructions on how to celebrate Christmas correctly. Eventually, teams of trained women would be flown into conquered lands to instruct the locals. This doesn’t sound like the slogans of a Christ-friendly regime. Some of the Nazi inner circle, including Heinrich Himmler and other SS leaders, were true pagans, worshippers of the ancient Germanic gods. One SS leader said, “We live in the age of the final confrontation with Christianity.” Christmas was rebranded as the winter solstice, the Julfest (Yuletide) season. A spinning sun, a symbol of the solstice, replaced traditional Christmas symbols. December 6th has been celebrated for centuries as the day of Saint Nicholas (the precursor of our modern Santa Claus), but in Nazi Germany it became Wotan’s Day. The Nazis rewrote history, claiming December 6th had belonged to Wotan, “The Rider on the Grey Horse,” all along, but then Christianity showed up and replaced him with St. Nick. Despite some current arguments that our modern Santa Claus was based on Wotan/Odin, the fact remains that Saint Nicolas was established as a magically flying, miracle-working saint long before Christian contact with Scandinavian. (To read about the history of Saint Nicolas and Santa Claus, see our previous article.) The first people in history, according to Bowler, to make the argument that Wotan/Odin was the original Santa Claus were the Nazis. As Hitler led Germany into war in 1939, the Christian message — with all its ideas of “peace on earth” and “turning the other cheek” — didn’t mesh well with the Nazi vision, to say the least. It’s likely Hitler had to take into account that Germany has a long, rich history of Christianity (Heck, Martin Luther — who launched the Protestant Reformation — was German!) and everyday Germans loved Christmas. It makes sense that Hitler would try to suppress the holiday celebrating the birth of the one who taught, “Blessed are the merciful, for they shall receive mercy… Blessed are the peacemakers, for they shall be called sons of God” (Matt 5:7, 9) and “Love your enemies and pray for those who persecute you, so that you may be sons of your Father who is in heaven” (Matt 5:44-45). Can anything be more oppositional to what Hitler was trying to accomplish? Death could not suppress God’s Son. Is it any wonder Hitler failed as well? Santa Claus is “the dominate fictional character in our world. Neither Micky Mouse nor Sherlock Holmes, Ronald McDonald nor Harry Potter wields a fraction of the influence that Santa does… His image is recognized and loved all around the planet,” Dr. Gerry Bowler, history professor at the University of Manitoba, writes in his book Santa Claus: A Biography. In our last GFTM article, Keeping the Chaos in Christmas: Pagan or Christian Celebration? A Short History of the Battle Over December 25th, we looked at what Dr. Bowler documents so well in another one of his books, Christmas in the Crosshairs. As we saw, many of the modern debates about Christmas have been going on since the beginning, including whether the celebration of Christ’s birth has been too heavily influenced by pagan folk customs. Of course, one can’t enter into these debates without the jolly fat man being considered either. Gift-giving goes way back to the pagan festivals Christmas eventually replaced, and there is a “long association between Christmas and gift-giving” that was “long criticized by the church” for materialism and “lingering paganism.” But the popularity of these customs among the everyday people won out, and eventually the church Christianized them. Gift-giving for Christmas was linked by the church with charity to the poor and the bringing of gifts to the newborn Jesus. Yet, the gift-giving Saint Nicholas didn’t appear until the 12th Century. Traditions existed of gifts being delivered to children by various miraculous saints on the eves of their holy days: Saint Barbara, Saint Martin, Saint Lucia, the Wise Men, and others. But Saint Nicholas, by far, was the most popular. Little, if anything, can be said with any historical certainty about St. Nicholas. He was the bishop of Myra on the coast of modern Turkey in the early 4th Century. He allegedly died on December 6, 343 AD. In the 12th Century, he was believed to be a magical deliverer of small gifts to kids on the eve of his day, December 6. Children prayed to him and left out their shoes to be filled with treats. But legend says he did much more than that. He was a wonder worker of miracles; in fact, he was a darn super hero long before the first comic book was ever imagined. He rescued sailors, soldiers, children, starving people, and slaves. He once saved three daughters from being sold into a life of prostitution by secretly delivering bags of gold to their poor father at night. Perhaps this has some truth to it as any non-super human could perform such a heroic act, but he also brought three murdered young men back from the dead after they were dismembered, shoved into barrels, and pickled! Apparently, he flew long before Superman entered the scene. He also was able to do what can only be called teleportation of both himself and others. Clearly, he was a nurturing, passionate (super) man, but he was no wimp or pushover either. He often was portrayed as carrying a whip or rod. Children both loved and feared him. He expected children and others to keep up with their church lessons and to be moral. My mother-in-law, who grew up in Germany, said when she was a child someone dressed as St. Nicholas visited their home. He asked her and her siblings if they had been behaving. Her father replied, “Not all of the time.” St. Nicholas then gave each of their hands a stern smack with his rod. After the Protestant Reformation in 1517, the tradition of Saint Nicholas, along with devotion to other saints of the Catholic Church, came under fire and were banned in areas controlled by Protestants. In England, Elizabeth I in 1558 ended all Saint Nicholas related activities. In England and Scotland, gift-giving moved to New Year’s Day. But Baby Jesus just wasn’t menacing enough for parents. Parents wanted a figure that would instill some fear into their kids to help keep them in line. Saint Nicholas was benevolent but also a disciplinarian. After all, the dude carried a rod for beating children. So, new figures started to appear who accompanied the Christ Child to substitute for Saint Nicolas’ rod. But these characters brought menacing to a whole new level! Many were downright horrifying: Aschenklaus (Nicholas in Ashes), Pelznickel or Belsnickel (Nicholas in Furs) and Ru-Klaus (Rough Nicholas), along with an “assortment of devils, witches with iron teeth, female disembowers, monstrous goats, or monks armed with switches” and Krampus, Hans Trapp, and Klabauf, who carried whips, chains, and sacks to steal away children. Meanwhile, Catholics kids in southern Europe got the better end of the deal. They received gifts on Epiphany (January 6) from the Three Kings or the kindly good witch Befana or a “pooping log” (!?!). It was not until the 1800s that our modern version of Santa Claus emerged. More poems soon followed by others, one calling him “Sancte Claus.” In the next few years, variations of the Dutch name for Saint Nicolas, Sinterklaas, appeared in American print: Santa-claw, Santeclaus, Sandy Claw, Santiclaw, Sanctus Klaas. All were based on oral, folk traditions with slightly different takes on the gift-giving wonder worker. Even his size was debated. Was he a small elf, even thumb-sized, to fit down chimneys? Was he a bearded grandfatherly-type or a smooth-faced youth? Sometimes he was dressed like a Dutch peddler; at other times he was dressed like George Washington. By 1850, his home was securely set in the Arctic where he lived with his minions, a horde of elves. In the 1860s, German American cartoonist Thomas Nast in Harper’s solidified what Santa looks like today. In Europe, most continued to hold on to their own versions of a magical figure delivering Christmas goodies, but the harsher holdouts from the Middle Ages — Perchta the Disemboweler in central Europe; Père Fouettard and his whip in France; the demonic Krampus, who stole children in Austria; the cannibal giant Gryla in Iceland; the horrifying goat-beast Joulopukki of Scandinavia — were replaced by a considerably more kinder, gentler version of “Santa.” Father Christmas, Pere Noel, Bobbo Natale, Samiclaus, and others emerged. They all were variations of the Santa Claus theme, but all were big-hearted, grandfatherly gift-givers. Bowler writes, “By midcentury the American Santa Claus was not only a fixture in the stories told in American homes, he was a positive boon to merchants.” Whatever else he was, this Christmas gift-bringer ended up being a business man’s dream. My wife and I decided a while ago that we would not perpetuate the myth of Santa Claus in our family. Feel free to start judging us now as crazy Christians who yell about the “war-on-Christmas,” yet long before I was a Christian, back when I still considered myself an atheist, I found this cultural tradition of lying to our children about an old man who comes down our chimneys strange. Forever vivid in my head, right down to the inflection in her voice and her angry little face, is the memory of when we broke the news to my younger sister that the big guy with the white beard was all make-believe: “You lied to me!” It was part incredulous question and part harsh condemnation. Now, to be perfectly transparent, it’s not just that my wife and I think that this culturally permissible fabrication is a bit weird, but that it could also be potentially damaging to our children’s faith in God. I remember wrestling with the idea of Santa Claus as an elementary school student. How did Santa deliver all those gifts in just one night – even taking into account time zones? Why did my mom lock herself in her bedroom to wrap gifts for so long and then in the morning only one gift under the tree was from her and my dad? Something odd was afoot. One of the reasons I continued to believe was I couldn’t comprehend why my parents would lie about such a thing to me. It’s not difficult to imagine the train-of-thought from there: If my parents would lie to me about some silly guy bringing me gifts (or the Easter Bunny or the Tooth-fairy or – the most diabolical! – the Elf-on-the-Shelf) maybe this whole God thing is a big, fake story too. I can’t say the Santa Claus myth had any direct connection to my skepticism about Christ, but sometime in middle school I found myself questioning the truth of the Bible like I did the truth of Santa years before. Having no one to answer my questions, my hard agnosticism lasted into my thirties. This Christmas season is the first year our five-year-old son is talking a lot about Santa Claus. So, I did it. I said, “Well, you know, Santa isn’t real…” I said it’s okay to like Santa, the same way you like Batman, but it’s mommy and daddy who give you gifts on Christmas. He thought about it but didn’t have much to say at that moment, but he still talks about Santa daily. And perhaps my wife and I have been overdoing it a bit because one time when he brought up St. Nick and I reminded him he isn’t real, he responded with a tone I’ve only heard teenagers use: “I know, daddy.” I wasn’t looking at him because I was driving, but I think he might’ve even rolled his eyes. But, the thing is, after the first time I told him that Santa is fiction, I suddenly realized I had totally overlooked something important: I, then, adamantly made clear that he wasn’t to tell other kids this. It was okay for them to believe in Santa. Five-year-olds aren’t known for keeping secrets, and I suddenly pictured my kid ruining Christmas for tons of his friends and their parents hating me forever. Yet, I haven’t had to worry about this, not because my son is the model of Christ-like obedience to his father, but because my son doesn’t believe me. He sides with his friends. Apparently, they’re having fiery discussions about this. More often than not, after picking him up from daycare, my wife and I are told something like, “Martina says Santa is real” like we’re fools for doubting. Next to nothing can be known historically about the real St. Nicolas. One popular story among theology nerds (ironically, despite Nicolas’ unchristian behavior) has him slapping the heretic Arius at the council of Nicea. Unlike the real St. Nicolas, we can be quite sure historically about Jesus. With over 2,600 ancient manuscripts of the New Testament, we can be confident the eyewitness accounts of Jesus’ life have been passed on to us without corruption. Within the New Testament, we find early confessions of faith that predate the writing of the New Testament. Immediately after the writing of the New Testament, we have the witness of the early church fathers. 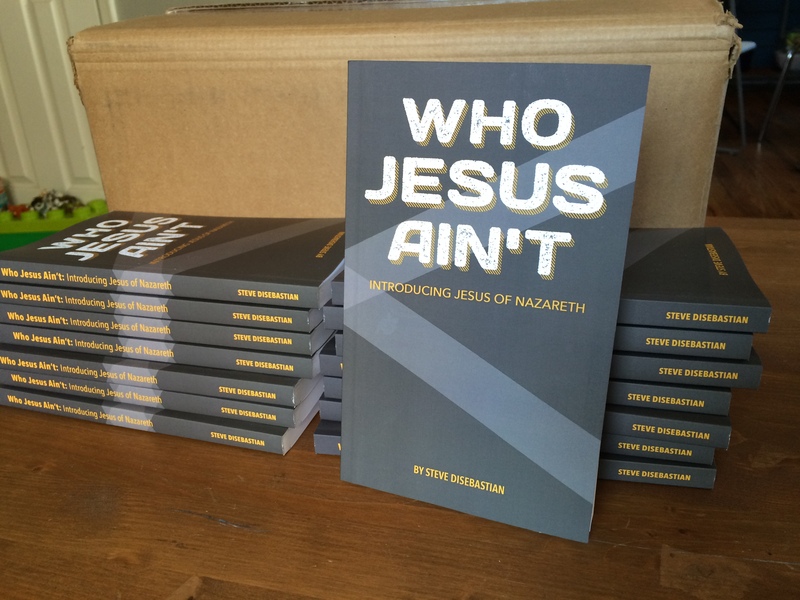 We even have first and early second century non-Christian writings about Jesus. The historical argument for the life, ministry, crucifixion, and resurrection of Jesus is a surprisingly strong one. Perhaps I need to explain this all to my five-year-old instead of arguing about Santa Claus. Annual Christmas Comic 2015! Merry Christmas from GFTM! Click on the comic to enlarge it…. 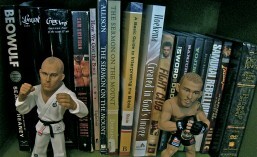 New from GFTM Blog: Available in paperback for $9.00 (or less) and Kindle version for $3.50 (or less) on Amazon. Or learn more here. 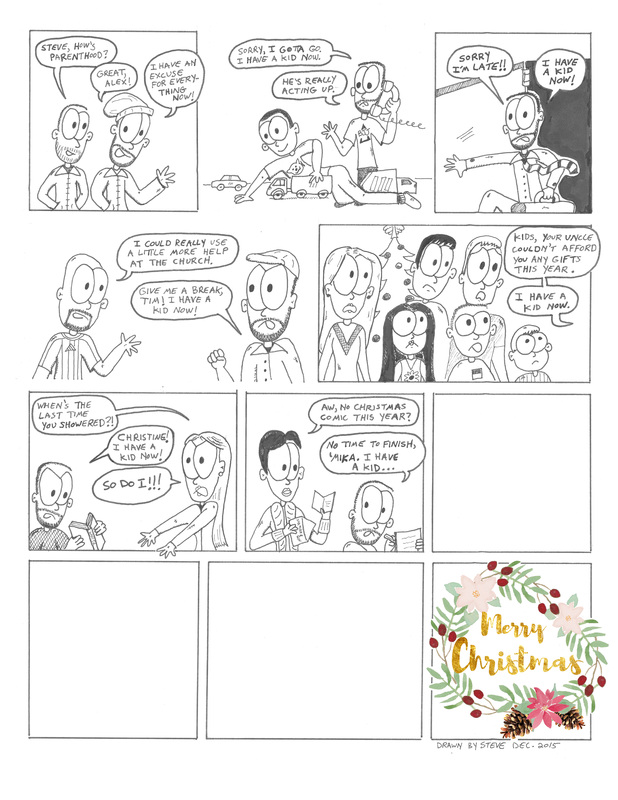 Christmas Comic 2014! Merry Christmas from GFTM Blog! 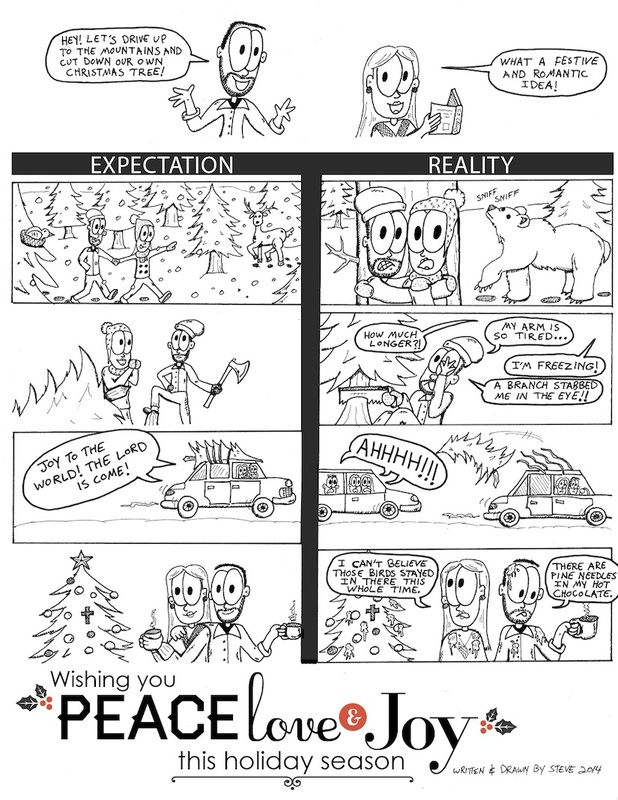 Here is my annual Christmas comic for 2014! No king but Christ, and the King is born! Merry Christmas! Christmas Comics from past years: Click HERE and HERE! Is There Evidence of Jesus Outside the Bible? GOD FROM THE MACHINE has published it’s first book! Searching the Bible for Mother God is for educating both those outside and inside the growing “Mother God cult.” Visit our page HERE.